I made a few treats for a Beach themed wedding reception that I would like to share with you! I knew I wanted to make a cake and I would have a bunch of cake scraps left over so cake pops were a must too! I was also on Pinterest and found the most adorable cookies, so of course I had to make those too! 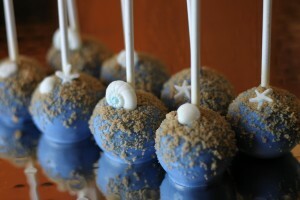 I wanted to make cake pops with Sea Shells so the best, easiest way to do that is with a mold!! I found these online from Lollicakes by Ella and thought they would be Perfect!! 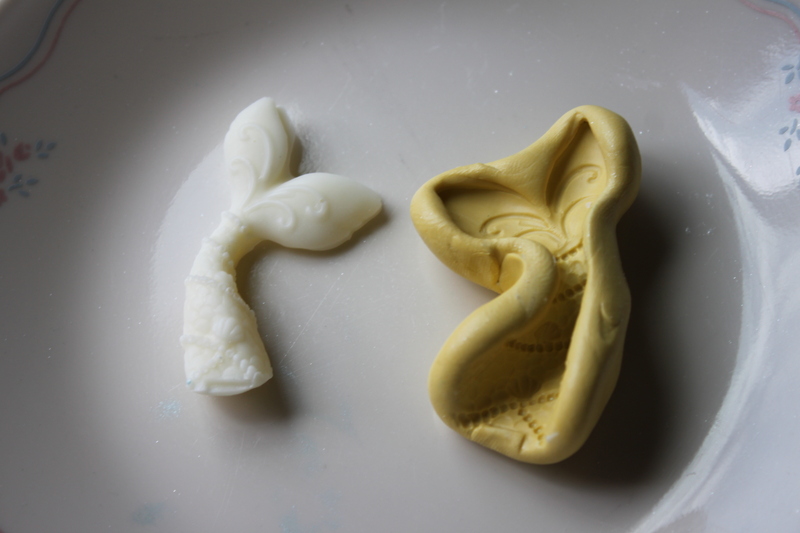 I love molds because you can do all of your decorations far in advance! I just melted a bit of white almond bark or candy melts in the my sandwich bag and piped small amounts into each shell area. To make sure there are no empty areas from any bubbles that may form I just use a toothpick and swirl it around into all the crevices. 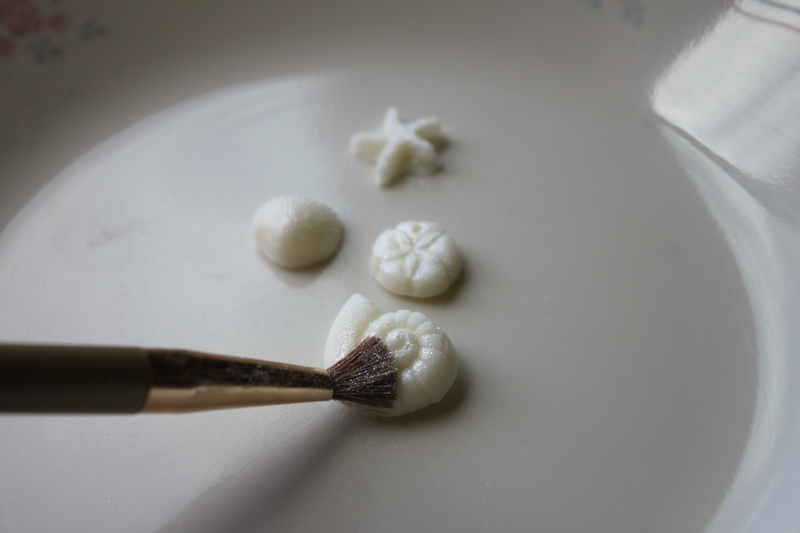 Once they set just pop them out of the mold and you have perfect little shells! I thought dusting them with a little white Pearl Dust really brought out all the details. I also got this mermaid tail, so I made a few of these as well! Once I had all my molded pieces done it was time to move on to the cake. 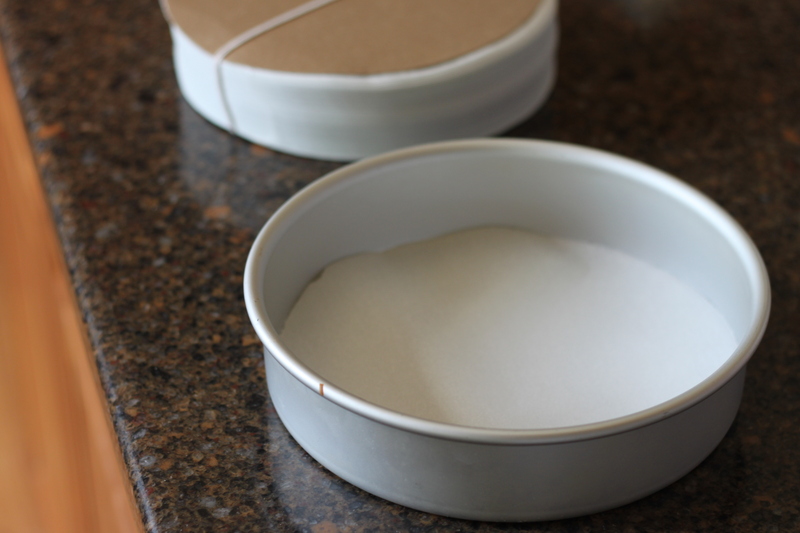 I used to use a little crisco and flour on all my cake pans so the cakes would come out of the pan, but I recently got a million 8″ parchment paper circles! So now I just pop one of these inside and the cakes come out of the pan perfectly! I love it when I can skip a step!! I was making a 3 tier cake. 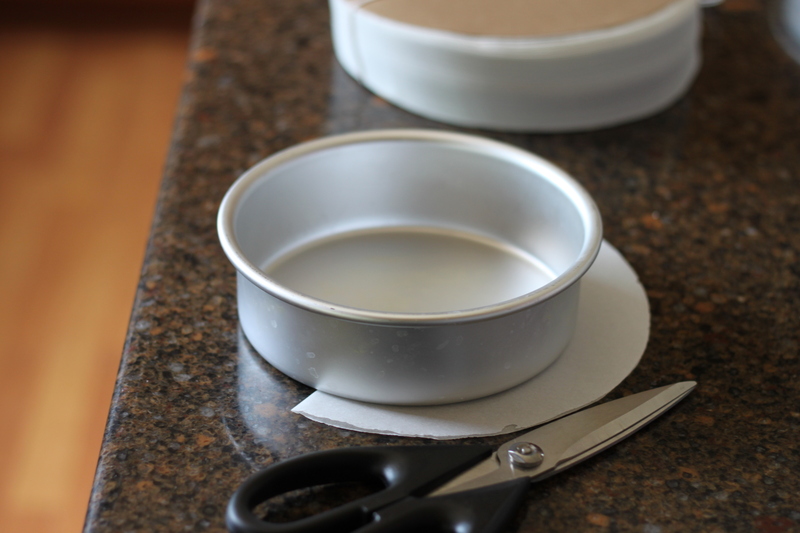 10″, 8″, and 6″ so for the 6″ I just cut one of the 8″ parchment circles to fit the pan. A rough estimate is close enough! 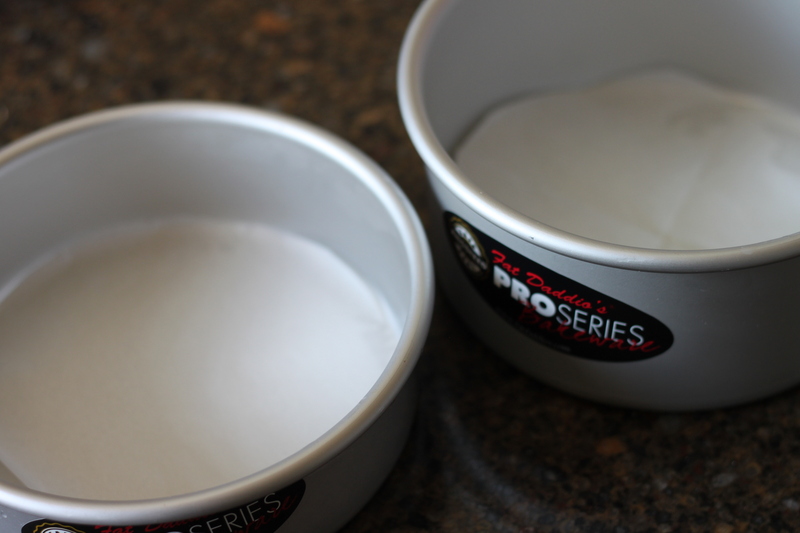 Separate this batch of icing equally into 4 bowls. I colored 3 of the bowls, each in a lighter shade of turquoise leaving one white. 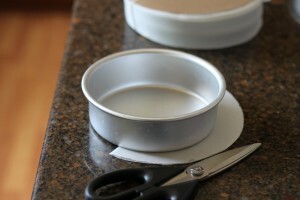 Next I put the cake on a turntable and marked the cake into 4 sections. 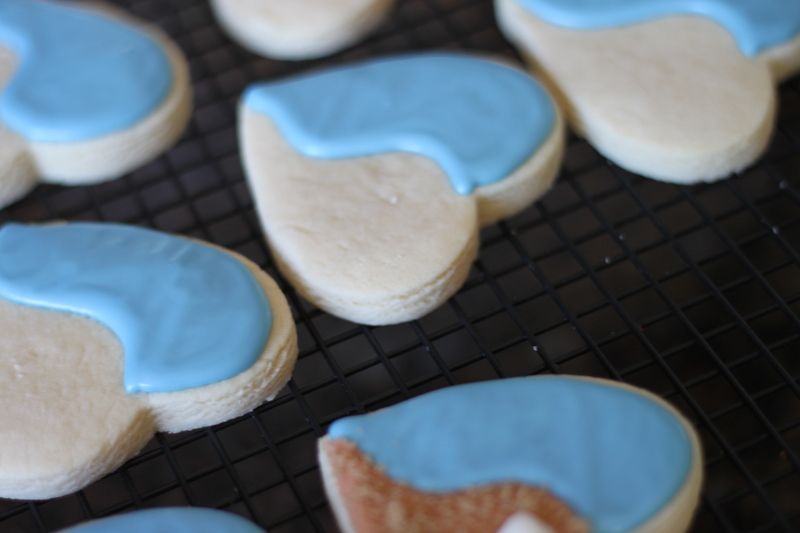 Then started to spread each color of frosting on, in each of the 4 sections. I wasn’t worried at this point what it looked like. I just needed about 1/4 inch of frosting on the cake in the 4 colors in each of the marked areas. 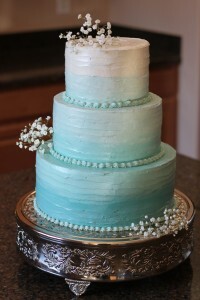 Once it was coated in the ombre turquoise icing I used a large off set spatula and starting at the bottom I held the spatula against the icing and turned the cake. That gave me that wave like texture. 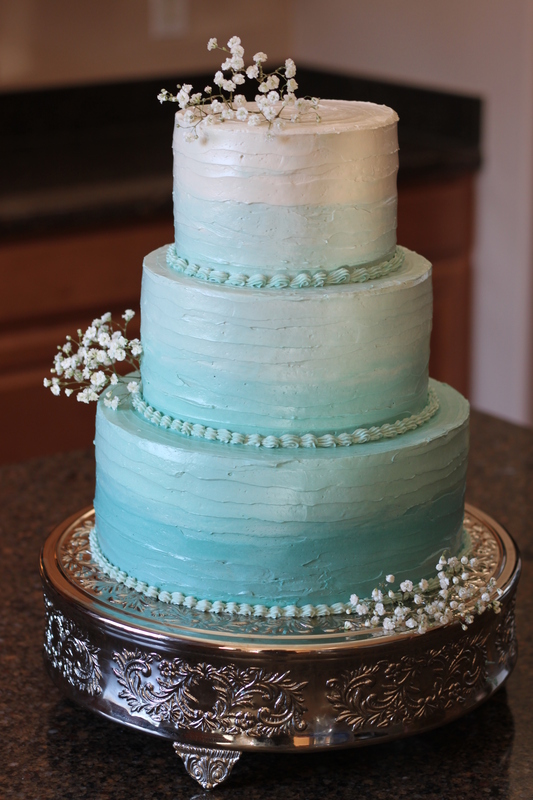 To finish it off I did a quick shell border around the tiers with my #15 tip and put a pieces of baby’s breath on each of the tiers. Next I made the cookies I saw on Pinterest! 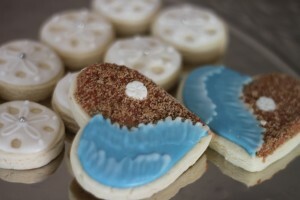 These Sand dollars pinned by Sugarbelle were just way to cute not to try! The only thing I did different is to add a little 4mm silver dragee to the center! 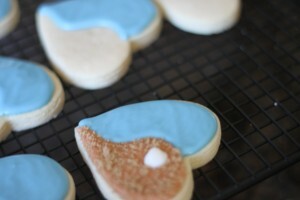 Then there were these heart cookies on Pinterest too! HOW. CUTE. ARE. THESE! Then I went back with tan Royal Icing and before it dried I used one the sea shells from the Lollicakes Mold and then covered over the rest with brown sugar. For the finishing touch add a squiggly line for the “Waves” and then with a dry or barely damp square paint brush (used only for food) use the corner of the brush and pull down. The Brush Embroidery Technique. 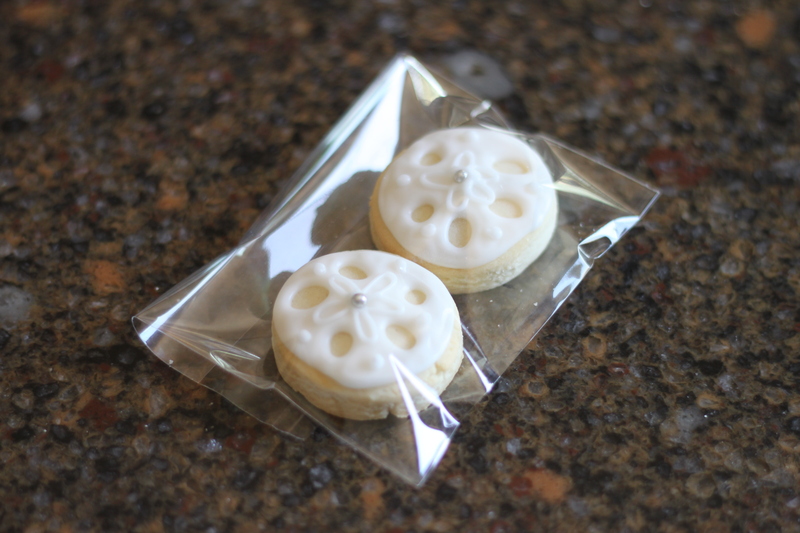 You can’t just hand over a whole bunch of cookies, so I neatly wrapped them in these self sealing bags (4X4 size)! 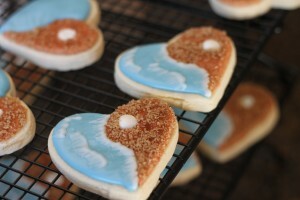 I put 2 Sand Dollars in Each bag and one of the hearts since the heart was a bigger cookie. These bags are great you just pull off the backing to the adhesive strip and fold the bag down on itself. Just make sure the back of the cookie is where the tape is, so the seam isn’t distracting from the decoration. Finally Cake Pop Time! I like to make these last just because they don’t need the drying time like the cookies! Taking all the tops from the decorated cake, crumble the cake, and knead it until it is a pliable dough. (consistency of Play-Doh) You can do it by hand (you also will need a bit of frosting this way), but it is faster if you just put it into the mixer or food processor and leave it in there till it turns to dough (if you are mixing the cake this way you only need frosting if you want to add some extra sweetness). 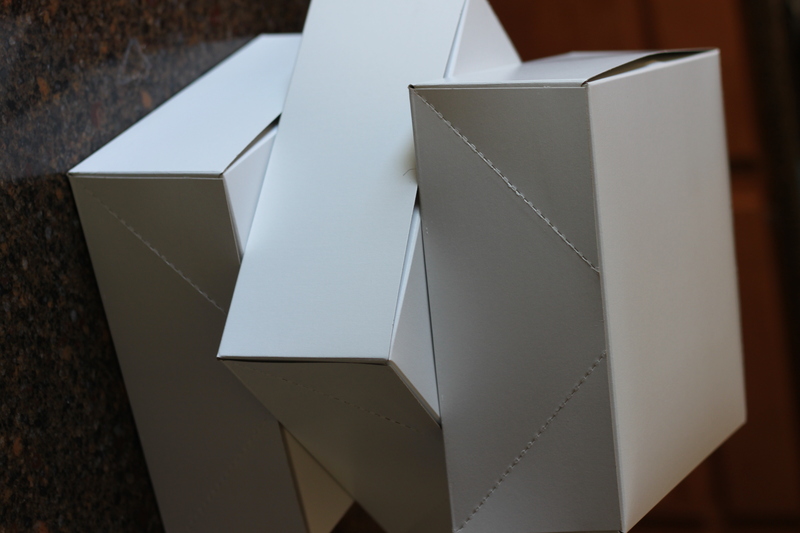 If you are just making cake pops, one box of cake will make about 30 cake pops (all an 1.25 in diameter – think ping pong ball size) Next take that dough and roll them into balls. We do this part with the help of the Easy Roller! It can roll an entire cake in no time at all, since it rolls 21 cake balls at one time & they are all the same size! Here is how it works if you haven’t seen or heard of it yet! 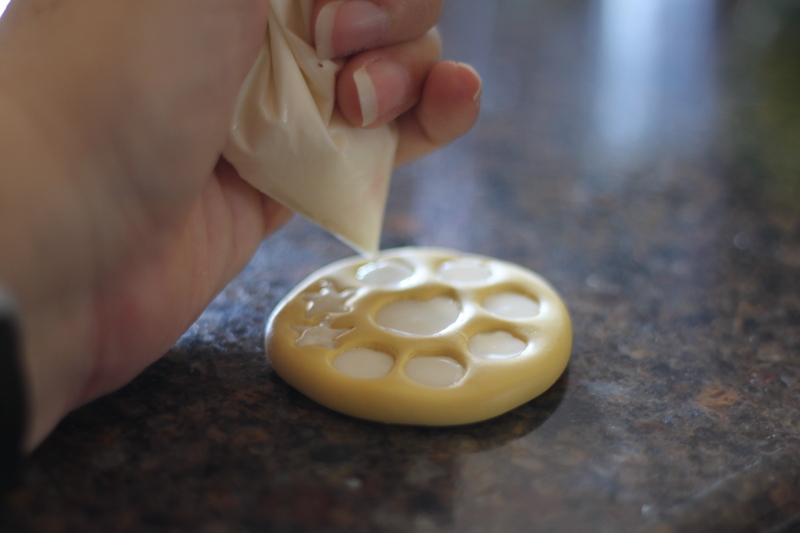 …if you dont make cake pops often but you still would like to make them faster our newest “mini” Easy Roller is on sale now for home use! Once all your cake is rolled into balls dip them into blue candy melts! Then add your Lollicakes Sea Shell Molded Shell and sprinkle brown sugar for the “sand” then place to dry on wax paper! So Easy! 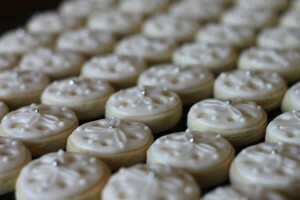 Take a look how these turned out! …And don’t forget the mermaid tails! 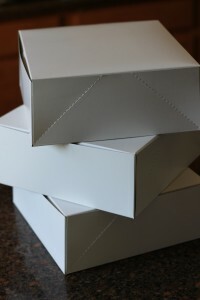 I have always individually wrapped my cake pops in 4X4 Flat Cello Bags and when I have more than about 18 cake pops to box they go in these 10X10x4 Automatic boxes. 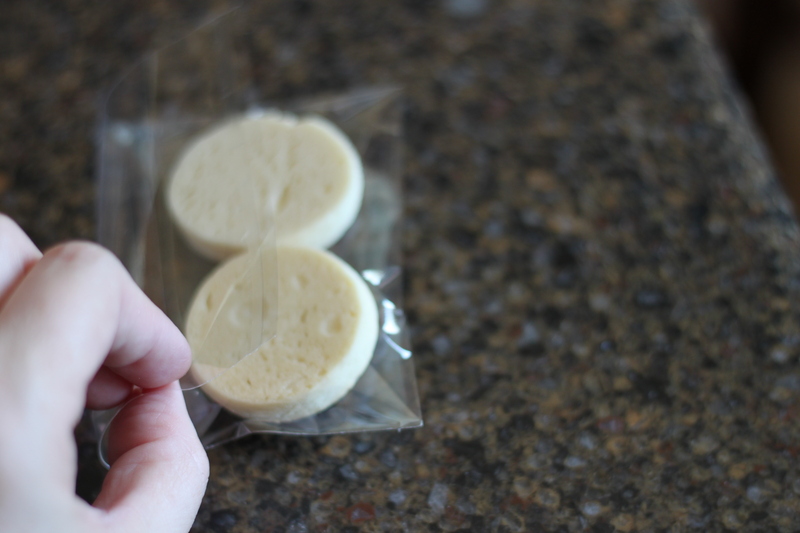 Again, you can’t just hand over a box of cake pops without them being wrapped first. If I were to try to just box them without a wrap over them they would have smudge lines all over them and not look as good. Plus in AZ you are just asking for a stick melty mess;)! I I have 2 boxes of cake pops and a box of cookies here:)! 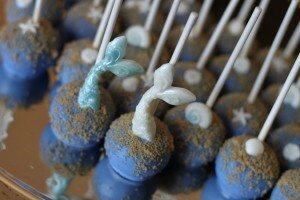 Now, I don’t make cake pops for sale anymore, only for tutorials for you:)! 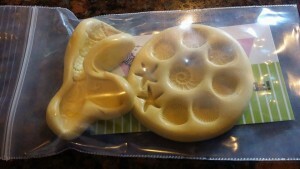 SO, I would like to pass along my newly acquired Lollicakes by Ella Sea Shell mold set! Would you like to have it? All you have I am going to pick a random winner and to enter is as Easy as 1 -2 – 3! “Like” Lollicakes By Ella so you can find cake pop molds when the time comes up. CONGRATS TO Brittany W. from Portland, Oregon You WON!! 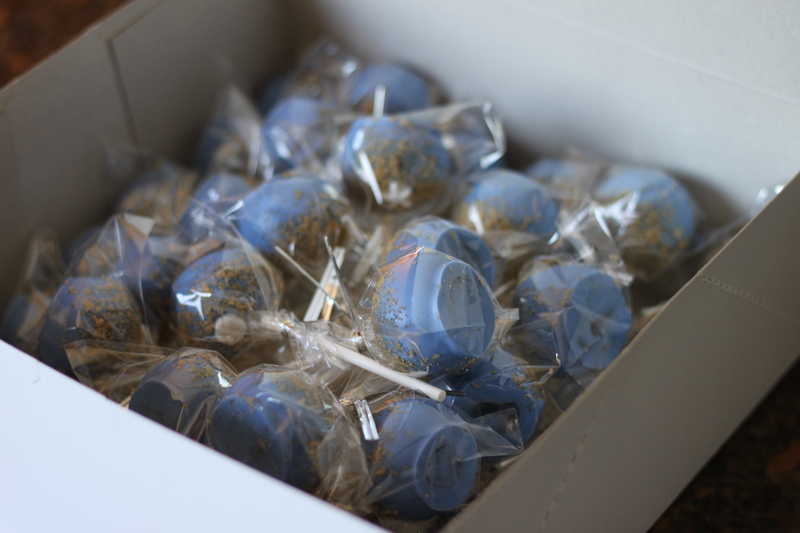 Email us at info@thebestcakepops.com!